Photodon Ultra is possibly one of the safest surface cleaner solutions available on the market today. 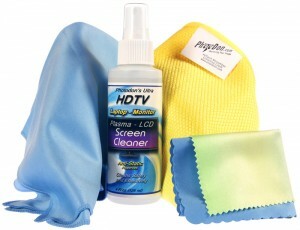 This 'Green' screen cleaner is safe for screens with anti-glare/anti-reflection coatings such as those found on today's computer monitors, HDTV and Plasma screens. This solution is safe for pets, fish and plants in aquariums. It's also great for the office environment and for people using this product in small quarters. Many cleaners can cause severe allergic reactions, eye burns and or eye injuries or the possibility of infant, children or pet poisoning if mistakenly ingested. None of these possibilities exist with the Photodon Ultra cleaning solution. The Photodon Ultra solution is a '100% Green Product' colorless/odorless and has been formulated by a company that respects the environment by creating safe, environmentally friendly products. This cleaner does not contain alcohol, ammonia or vinegar, all of which can affect surface coatings or plastics over time. This entry was posted in Screen Cleaning and tagged Cleaners, Cleaning, Environment, Green, Photodon Ultra Screen Cleaning.